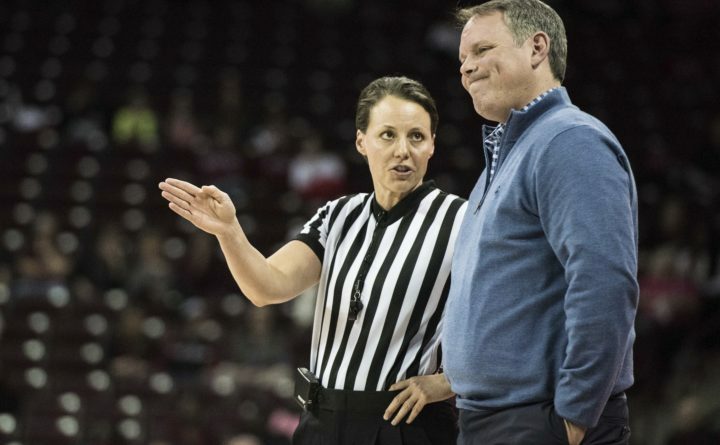 University of Maine men's basketball coach Richard Barron, pictured during a women's game in 2016, said he doesn't expect the NCAA's new Division I transfer rule to significantly affect the process. Former University of Maine running back Josh Mack (34) carries the ball during a 2017 game against Massachusetts. Players such as Mack, who transferred to Liberty University, will have an easier time making such a move with a recently implemented NCAA rule change. Transferring student-athletes are part of the puzzle for NCAA Division I athletic programs around the country, and the University of Maine is no exception. The Black Bears men’s and women’s basketball teams have experienced significant roster turnover in recent years. The UMaine men’s program has lost nearly a dozen players to transfer over the past two years, including several following the 2017-2018 season. The UMaine women had six players leave the program for other schools during that time, including five after the 2016-2017 campaign. 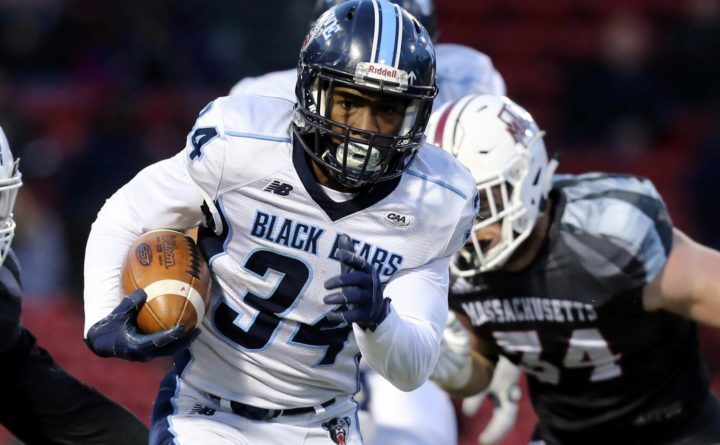 The Black Bears football program has experienced only a few such departures, but lost sophomore tailback Josh Mack to transfer after last season. Mack, the leading rusher in the Football Championship Subdivision with 1,335 yards in 2017, is set to continue his career at Liberty University nisin Lynchburg, Virginia. A proposal approved recently by the NCAA’s Division I Council will change the process by which the transfer process begins. The new “notification of transfer model” that becomes effective Oct. 15 will allow a scholarship student-athlete to inform his or her current school of their desire to transfer — rather than having to seek permission from the school to contact another college in order to move on. The school is then required to enter the student’s name into a national transfer database within two business days and, once the name is in the database, coaches from other schools are free to recruit the student-athlete. Nicholas Clark, a recent graduate of and former football player at Coastal Carolina who represents the Division I Student-Athlete Advisory Committee on the council, said in an NCAA press release announcing the change that it promotes fairness and the well-being of college athletes. The change seeks to discourage coaches from recruiting student-athletes from other Division I schools while also addressing a practice in which some coaches or administrators have sought to prevent student-athletes from having contact with specific schools, according to the Washington Post. Individual conferences; however, still may make rules more restrictive than the national rule. Richard Barron, the former UMaine women’s basketball coach who in March was named the men’s basketball coach, said he didn’t anticipate the new database for transferring student-athletes would be of much help to coaches with sudden roster vacancies. Barron said one aspect related to the new rule that already has been approved by the NCAA’s autonomy conferences — the Atlantic Coast, Big 10, Big 12, Pac 12 and Southeastern — could make coping with the loss of players who transfer a little easier for college teams. Harasymiak said one of the biggest defenses schools have against the continuing frequency of transfers rests within each athletic program. But that can be a difficult sell for some athletes. “It’s just that a lot of kids these days want the instant gratification of, ‘I’m the best kid ever, I never had to work for anything, I was the best player on my high school team, so play me coach,’” Harasymiak said. “It doesn’t work out that way in Division I, it just doesn’t. The NCAA’s Transfer Working Group will continue to consider other transfer issues, including rules surrounding postgraduate transfers, and still is exploring the possibility of uniform transfer rules. Both Harasymiak and Barron agree the NCAA’s transfer formula remains a work in progress.